Researchers have designed a graphene-based tattoo that can be directly laminated onto the skin with water, similar to a temporary tattoo. But instead of featuring artistic or colorful designs, the new tattoo is nearly transparent. Its main attraction is that graphene's unique electronic properties enable the tattoo to function as a wearable electronic device, with potential applications including biometric uses (such as measuring the electrical activity of the heart, brain, and muscles), as well as human-machine interactions. The researchers, led by Deji Akinwande and Nanshu Lu at the University of Texas at Austin, have published a paper on the new graphene electronic tattoo in a recent issue of ACS Nano. In some ways, the graphene electronic tattoo is similar to commercially available electronic devices for health and fitness tracking: both kinds of devices are capable of heart rate monitoring and bioimpedence (a measure of the body's response to an electric current). But because the ultrathin graphene tattoos can fully conform to the skin, they offer medical-grade data quality, in contrast with the lower performance of the rigid electrode sensors mounted on bands and strapped to the wrist or chest. Due to the high-quality sensing, the researchers expect that the graphene tattoos may offer promising replacements for existing medical sensors, which are typically taped to the skin and require gel or paste to enable the electrodes to function. "The graphene tattoo is a dry physiological sensor which, because of its thinness, forms an ultra-conformal contact to skin, resulting in increased signal fidelity," coauthor Shideh Kabiri Ameri at the University of Texas at Austin told Phys.org. "Conformability results in less susceptibility to motion artifacts, which is one the biggest drawbacks of conventional dry sensors and electrodes for physiological measurements." The new tattoos are made of graphene that is coated with an ultrathin backing layer of transparent polymer poly(methyl methacrylate) (PMMA). During fabrication, the graphene/PMMA bilayer is transferred to a piece of ordinary tattoo paper, and the bilayer is then carved into different patterns of serpentine ribbons to make different types of sensors. The finished tattoo is then transferred to any part of the body by bringing the graphene side in contact with the skin and applying water to the back of the tattoo paper to release the tattoo. The tattoos retain their full function for around two days or more, but can be peeled off by a piece of adhesive tape if desired. Since the researchers previously showed that, theoretically, a graphene tattoo must be less than 510 nm thick to fully conform to human skin and exhibit optimal performance, the tattoo they fabricated here is just 460 nm thick. Combined with graphene/PMMA bilayer optical transparency of approximately 85%, and the fact that the tattoos are more stretchable than human skin, the resulting graphene tattoos are barely perceptible, both mechanically and optically. Tests showed that the graphene electronic tattoos can be successfully used to measure a variety of electrophysiological signals, including skin temperature and skin hydration, and can function as an electrocardiogram (ECG), electromyogram (EMG), and electroencephalogram (EEG) for measuring the electrical activity of the heart, muscles, and brain, respectively. 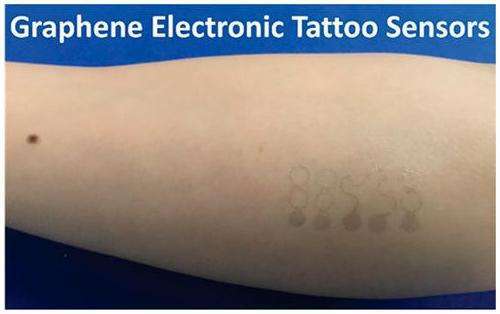 "Graphene electronic tattoos are most promising for potential applications in mobile health care, assisted technologies, and human machine interfaces," Kabiri Ameri said. "In the area of human machine interfaces, electrophysiological signals recorded from the brain and muscles can be classified and assigned for specific action in a machine. This area of research can have applications for the internet of things, smart houses and cities, human computer interaction, smart wheelchairs, speech assistance technology, monitoring of distracted driving, and human-robot control. Recently we have demonstrated the application of graphene tattoos for sensing human signals to wirelessly control flying objects. That demonstration will be reported in the near future." If it could measure lactate in blood I would be sold!